WWOOF – on my way: make it someday. 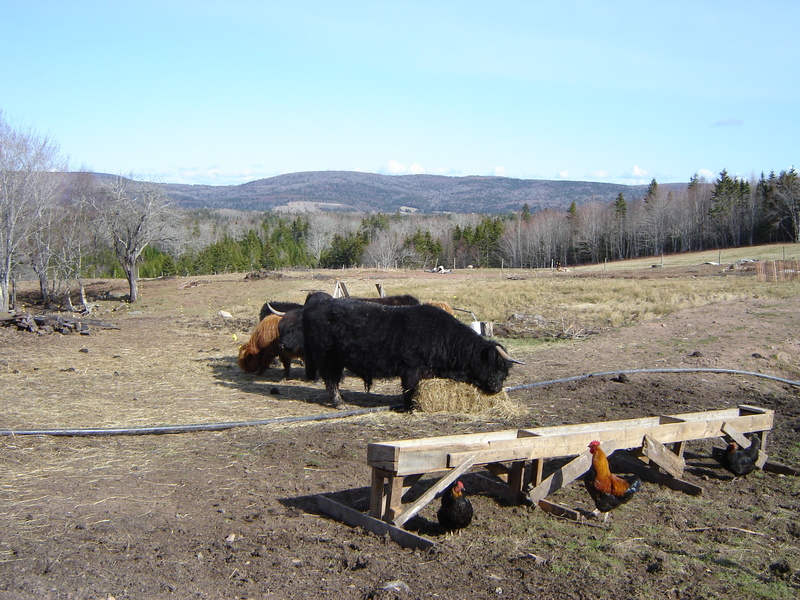 Nova Scotia in April – even an unusually warm April – isn’t really conducive to planting vegetables. But that doesn’t mean that I didn’t spend a lot of time thinking about growing things. 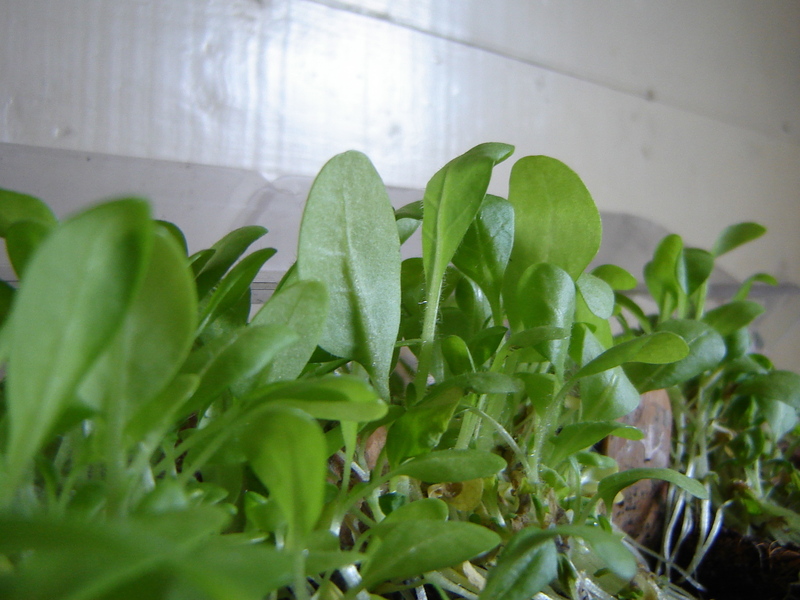 The baby plants on top of the rabbit cage in the kitchen were a constant reminder that in a few short weeks, it was going to be all systems go on planting the garden. In addition, the large tubs of potatoes in the basement, still left from last year’s crop, were a frequent addition to dinners – this was at least one crop where the family could feed itself comfortably from its own land. A garden that grows so much food is unlike the backyard varieties I’ve worked in before. 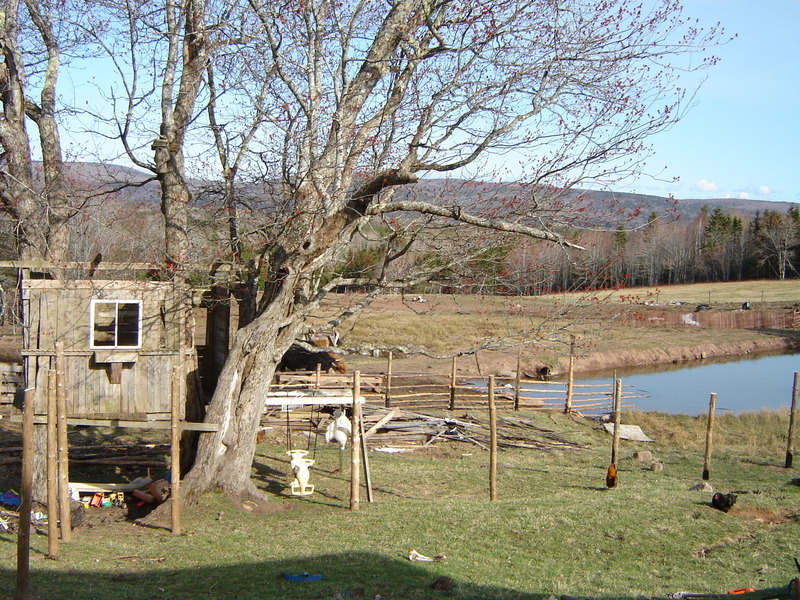 It filled two separate fenced-in (or, theoretically fenced-in) sections of land in between the barnyard and the pastures. There were multiple raised beds ranging from small, semi-circular ones for herbs to large plots that Brooke spent several hours rototilling. There were piles of compost and soil strategically placed in multiple spots around the gardens, tarps to cover recently excavated plots or delicate new plantings, and piles of rocks which had been dug out of the ground. The rhubarb was already growing, and in a few places vegetables were breaking through from bits of root that had been left in the ground after harvest. I spent an hour or so organizing the family’s extensive seed collection by type of vegetable, so that the planting process would go more smoothly once it began. Things were undeniably about to start moving. But even though things weren’t quite going yet, there was still plenty to do. Take the fruits, for example. A small orchard of young apple trees filled a slope above the house, and there was a small vineyard next to one of the garden plots. I learned (by reading) about pruning and grafting. Pruning seemed to have been neglected in order to focus on the more pressing needs of the farm, but one day, the family would be eating apples and grapes and making cider and wine from their own land, too. In line with the farm’s emphasis on permaculture (more on that in a later post), we hoped to make the garden attractive to beneficial organisms and unattractive to pests. I spent some time building boxes for solitary bees, using a handsaw to cut 2×4’s into smaller blocks (which turned out to be a workout!) and then drilling holes in them for the bees to next in. Solitary bees are non-colonial, and although honeybees and bumblebees are the first bees most people think of, the majority of bee species are solitary. Providing a spot for these bees to next and lay their eggs is good because it means they will pollinate your garden. There were a number of birdhouses up as well, with more in the works, and the family was planning on building bat houses too. I even learned about cultivating mushrooms. 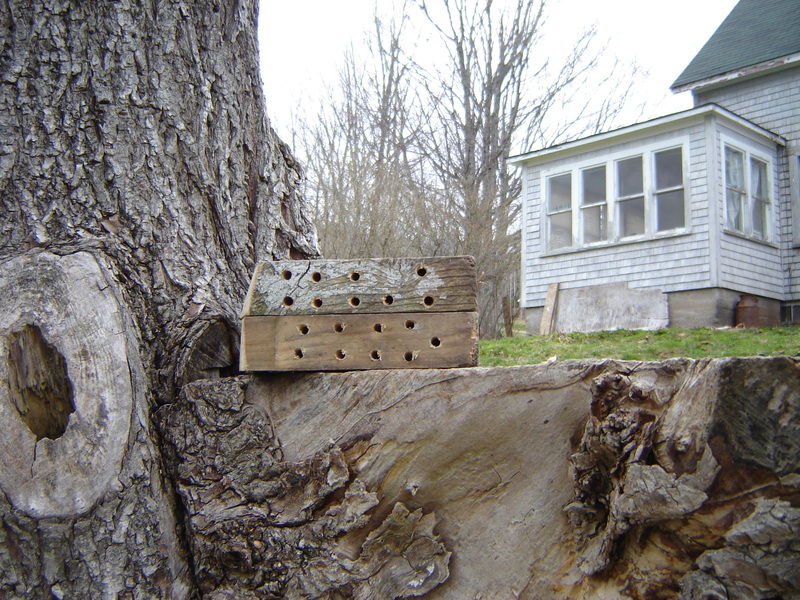 We took a number of hardwood logs and drilled holes in them – similar to the bee houses, but distributed around 4-foot sections of log – which would then be filled with shiitake mushroom spores seeded in sawdust. The logs would be left in a damp place, sprayed with water, submerged for a bit… and one day, they would have mushrooms growing out of all the holes and look totally crazy. It all seemed rather idyllic, but of course I wasn’t there for any of the hard work. Planting wouldn’t have been that bad compared to the extensive weeding that would be necessary for large garden plots, and I am sure that the harvests were completely crazy. But even though I was telling myself that the vegetables were, in fact, plenty of work, the idea of growing your own food seemed just as alluring as it always has. I was talking to Kate one day about how they still hadn’t figured out everything about the animals, or the best way to deal with them or even which ones to have, but in the last five years they had gotten “pretty good at growing vegetables”. I wish that I could go back to Old Man Farm in the summer, when things are growing wildly, and see what it looks like, and see Kate happily working among the plants. It all seems so satisfying to have that store of potatoes and carrots, a stockpile that lasts all winter, that you had dug out of your own ground in the fall. I am really looking forward to the day when I can plant my own garden next to my hypothetical tiny house and have it be mine. While there are many wonderful ways to garden, at this point in my voyage or gardening discovery, growing things seems kind of personal. You work with your hands, and there is this amazing process of creation (well, scientifically that’s not what it is, but metaphorically in a way it is); I want to hold those vegetables in my hands, to look at them and marvel at what has come out of the soil; I want to be in control of my own gardening destiny. I am 100% positive that this greediness, if you will, makes me a terrible person. 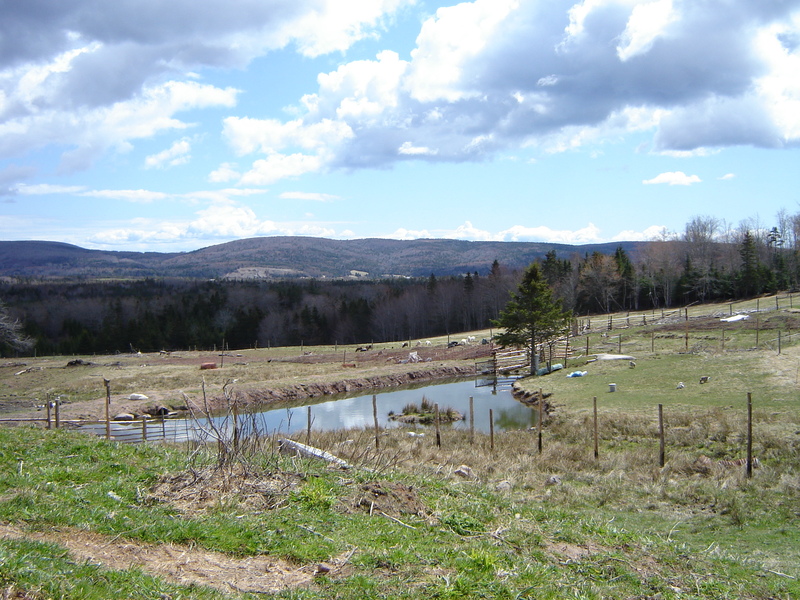 I am working to become more enthused about our community gardening projects in Craftsbury. Stay tuned for a more theoretical and ideological approach to growing things in the next installment. A quick note on some things I have been reading. Much has been made of the fact that a climate and energy bill now seems like it won’t happen, even though the Gulf Coast oil spill disaster makes the need appear so immediate to so many people. But interestingly enough there is another but of policy that approaches the problem in a different way. An editorial in Nature talks about a new system of spatial planning which will divide U.S. waters into nine areas, each regulated at a regional level by bringing together multiple stakeholders such as energy companies, fisheries, and water quality boards. It seems like this is a step in a good direction. Goats and sheep grazing on the far side of the garden. When I was looking for a farm to go work on, I decided that “animals” was a key component in my search. There were two reasons for this: one, I wanted to learn more about maintaining livestock, and two, I knew there wouldn’t be much work to do in the garden in April so far north. Old Man Farm had a little bit of everything: cows, sheep, goats, pigs, dogs, cats, chickens, ducks, and geese. I was able to get a sense of the relative levels of attention required by some of these different animals, as well as some sobering lessons about what can go wrong. I had the most interaction with the sheep, goats, and chickens. These are the animals that lived in the main section of the barn. The sheep and goats needed the most attention, partly because it was lambing season. They needed to be put out if it was a warm day, brought back in at night, sequestered if they appeared sick or lambing seemed imminent, fed hay since the grass wasn’t in, and generally checked on a few times a day. There was a calm of being in the barn, and Brooke spent a lot of time there just being with the animals. It was a nice place. lambs: you gotta check on 'em. I got to try shearing a sheep with hand-clippers, which was new. My grandmother had sheep which she bred for wool, and shearing was done by a professional, the wool bagged and washed and saved and then knitted into sweaters. This was the vision I had of shearing. 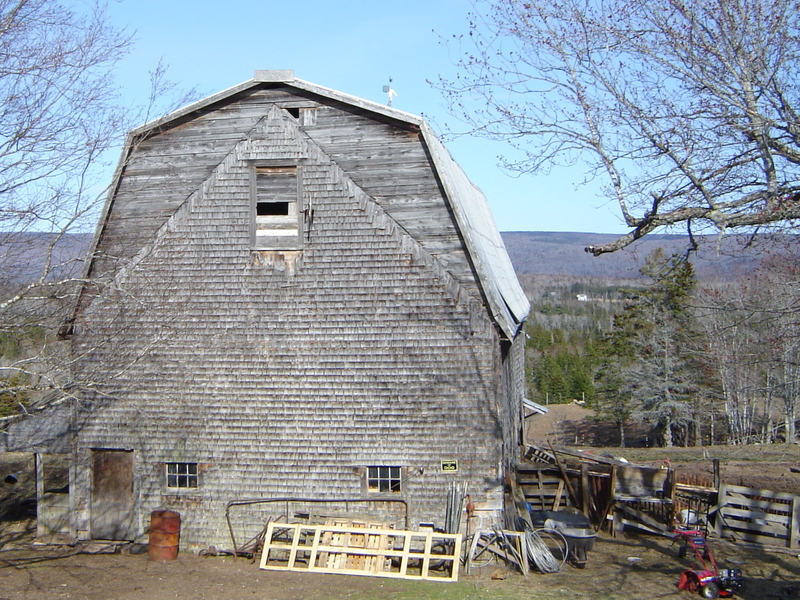 On Cape Breton Island, there isn’t much of a market for wool, so the Olands weren’t saving it for anything. It didn’t matter if the wool came off in clumps, fell on the straw, or got dirty in the shearing process. In a way this was disappointing to me. The sheep were where I learned the most about medical side of livestock maintenance. Two old ewes died while I was on the farm. They had been bought pregnant, along with three others, from a farmer who was culling them because of their age. Both developed toxemia (ketosis), which basically meant that they had no energy and didn’t even want to eat. We tubed medicine down their throats, put them under heat lamps, and did all we could for them, but they slipped away. Brooke had to then butcher them himself, a task that wasn’t particularly good for him on an emotional level. I watched the butchering since I thought it would be a good thing to know about – the reality of livestock farming, if you will. As for the next generation, in one case, the lamb was lost as well; in the other, we had an orphan on our hands. 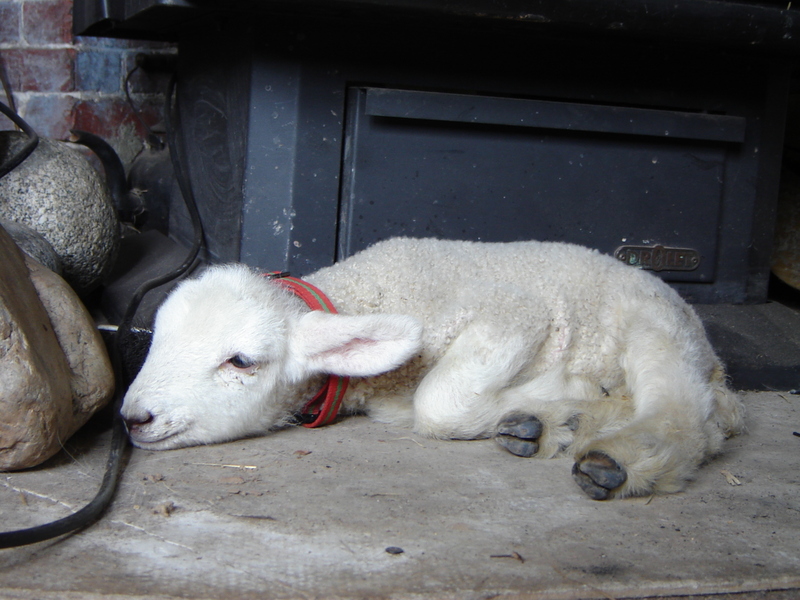 You might think that having a lamb in the house is cute, and great, and it is, to an extent. But it’s a hard road for those lambs, and for you, too… Brooke was a walking zombie at one point because the lamb had woken him up with its bleating so many nights in a row. The orphan developed scours, so we needed to medicate him. The goats had already kidded so they required a little bit less maintenance, and could go outside on colder days. I learned that while goats are cute, they are tough to herd! I usually had to lure them with a bucket of grain, but then the goats with horns would unintentionally spear me, which was annoying and sometimes painful. The chickens needed very little from us. They had lots of places to root for insects. In most cases, predators would be a major concern, but because the farm had three large, white livestock dogs, there didn’t seem to be any problems with chickens getting eaten. They produced more eggs than the family could consume. When I left, one hen was getting broody, so she was allowed to keep a dozen eggs; later in the season, there will be little chicks running around. The cattle were Highlands, a breed which can take care of itself quite well. They occasionally needed hay because the pastures weren’t quite going yet, but other than that were pretty self-sufficient. One of them had a calf and we hadn’t even expected it or done anything to prepare her. This was lucky, because perhaps the saddest thing that happened while I was there was that a yearling got stuck in some mud overnight and drowned. Pulling his body out of the mud was very sad, and afterward all the other cattle came over and sniffed him to say goodbye. Anyone who says that cows don’t have feelings is quite wrong. And then there were the pigs. They did an excellent job of rooting up ground that was being prepared for planting. However, they also needed quite a bit of extra feed, and were very aggressive at feeding time, pushing each other around and squealing. I learned to take the feed into their stall when they were out in the field and then call them in, so that I wouldn’t have to wade through them and hit them with a stick in order to get to the bucket. The ducks and geese were pretty self-sufficient. I don’t think we ever fed them anything. We ate one, though, and I learned how to pluck a goose (we never got the water quite boiling, so the process took longer than expected). 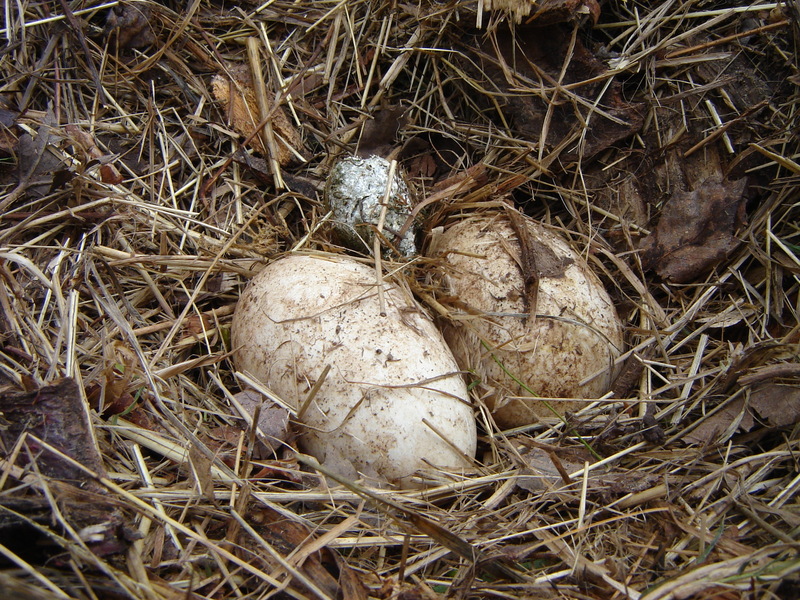 Goose eggs in a nest next to the woodshed. In general, the livestock required a surprisingly small amount of attention considering how many diverse kinds there were. There were the never-ending fencing projects, of course, but I think with a few good pushes, the fences could have been in good shape. Fencing is where, as a farmer, planning and preparation are essential. Fencing is a fact of life. The tough part with the animals is that the farm was using very little of their potential. They were no longer milking the goats, which means that they had to buy milk for their family, and also weren’t making cheese. 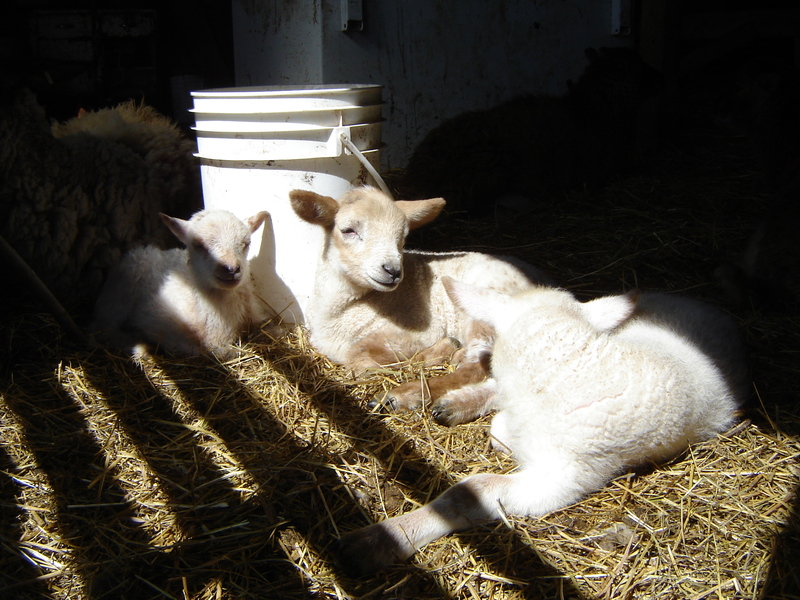 The male lambs would in theory be butchered, along with a few of the cattle, in the fall, but the Olands had trouble finding a butcher who would come to the farm. The beef brought in some money, but given that the cattle took three or four years to mature, I don’t know if they paid for their upkeep or not. The eggs were unmarketable because there was no henhouse, so they were usually dirty. The feed bills were, shall we say, high. I realized how expensive it is to have animals just for pleasure. Brooke indicated that he wasn’t interested in turning the farm into a money-making enterprise. He just wanted to feed his family and live sustainably. Which is totally fine: you can make that choice if you want to, and if you can afford it (the Olands were getting by, but barely). I think this was part of the reason that it seemed like the livestock didn’t take much attention. If, like most operations, you were trying to make money, or at least break even, you would need to be milking and making cheese and packaging and marketing your products. You needed to build the henhouse, and learn to accept butchering if you couldn’t find a butcher, and make sure that the butchering was done at the correct time of year (for instance, slaughter your geese in the fall, not the spring). Your general level of attention needs to be higher if you are marketing products to someone else rather than consuming them yourself. With such a variety of animals, it seems unlikely that the farm could operate in this manner with its current labor supply. Perhaps I’m being narrow-minded, but I think that with one full-time worker and WWOOFer help, a farm looking to sell products from the animals would need to focus on an area of expertise, as it were. You would need to decide which kinds of animals you could work with, easily and happily, and rely on, and get rid of the others. This was something up for discussion, as the Olands were contemplating reducing the herd of goats and selling a few sheep as well. The difference between having a few animals for your own pleasure and having animals as a business venture is not insignificant. My vision of my future, the perfect one where I have a mysteriously sufficient income stream, usually includes a tiny house, a garden, a horse, a dog, some chickens, and maybe some sheep (although with every passing year, I realize that the horse is pretty unlikely since it is the most expensive component of this dream future). My experience at the farm didn’t really change that. It would be easy to “start” with a few chickens, or a small flock of sheep, or even a pig. The pigs were probably the ones I learned the most about, honestly. They did a remarkable job getting the garden ready for planting; I hadn’t thought of them in such a useful sense before. And piglets, of course, are quite cute (that’s the girl in me speaking). Yesterday I was lucky enough to have an excuse to drive to the coast. When I decided to come to Nova Scotia, one of the things I was excited about was the ocean. I didn’t realize that Old Man Farm is actually not very close to the ocean at all! And while I had been hoping to go bike along the coast, it’s hard to justify driving for 30 or 45 minutes just to go biking. So, when Brooke said he had an appointment at Gampo Abbey and would I like to come along, I jumped at the chance. 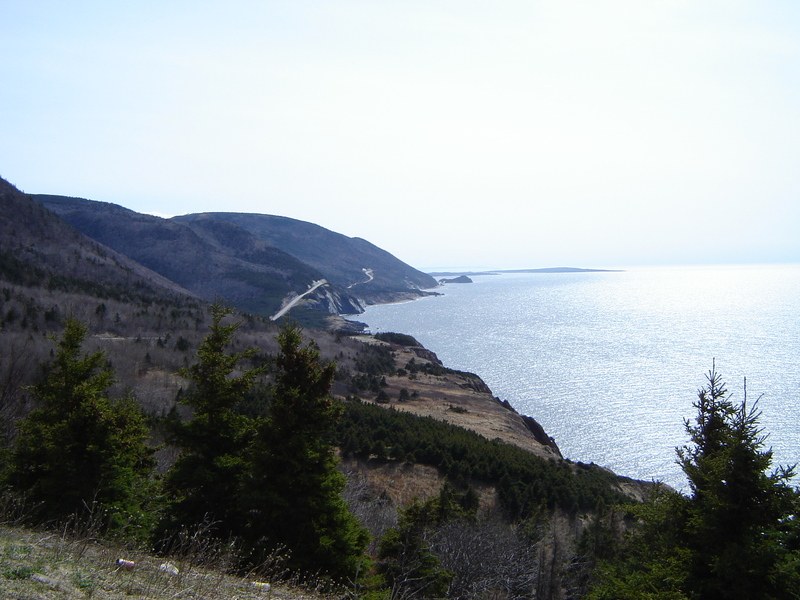 The Cabot Trail runs right through Middle River, so we drove it over through Margaree, Cheticamp, and up into the Cape Breton Highlands National Park. There are a million trails in the park and if I lived anywhere close by, I would go exploring there all the time. The highlands rise right out of the sea and it is very beautiful. Brooke describes it as a chilly version of Big Sur. 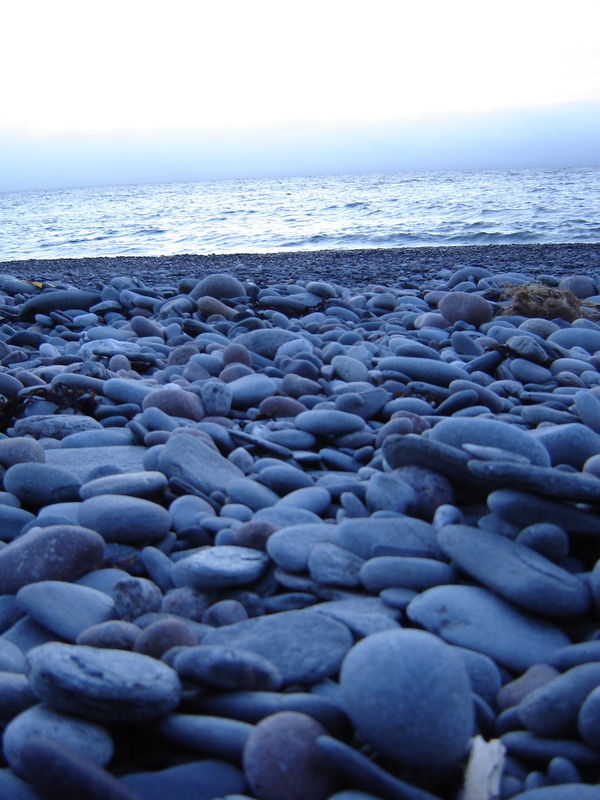 The water, ironically, is quite warm – the warmest water in the Atlantic for quite a ways, in the Northumberland Strait, and despite being so far north is quite nice for swimming in the summer. Probably not yet though… in fact, this time of year, the ocean is still usually covered in ice, but due to the unseasonably warm weather the whole Eastern seaboard has experienced this spring, it was totally open, making for nicer views. While Brooke had his appointment, I biked into the park a bit. It’s off-season for tourists, and so there was practically no traffic on the road. I really enjoyed my first ride of the year and the scenery of the highlands. You can still see snow off on many of the mountains. Then, I returned to the Abbey, where we participated in the evening chant and then ate dinner with the monks. The shrine was completely peaceful and smelled of candles; the windows were open so you could hear the wind, waves, and birds outside. I have no training in meditation but I could see how the Abbey was in a perfect place for monastic life. By the time we were eating dinner, fog was rolling in over the ocean. The monks talked about how the view of the ocean is different every day, and really every hour. They are very in tune with their place. On the way home, we stopped to enjoy the sunset on a beach. Unfortunately the wind was whipping in off the water, so it was quite cold, but I was still able to appreciate the pink light falling over the water and the pebble beach. I’m impressed that there were so many settlements on such a cold, windy coast – the winters must have been brutal – but at the same time, I think it would be a beautiful and amazing place to live, and whenever we passed an abandoned house, I would ask, how could you leave that behind? We were all given the month of April to do more or less what we wanted (as long as we didn’t get too out of shape; we will be tested when we return). After spending a week doing temp work for the Upper Valley Land Trust, my mom’s nonprofit, and then a long weekend in Craftsbury mapping all the trails with a GPS unit, I headed to Cape Breton Island, Nova Scotia. I’m staying with a family I found through WWOOF, working on their diverse farm in exchange for room and board. Old Man Farm takes a permaculture approach, integrating different aspects of farming and life itself into one cohesive system which attempts to provide as much of its own nutrients and energy as possible. My adventures here have already been several; I’ll write more later!